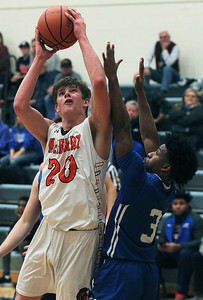 H. Rick Bamman - hbamman@shawmedia.com McHenry's Jacob Evans defends Burlington Central's William Hough in the first half of the championship game in the Burlington Central Martin Luther King Basketball Classic Monday, Jan. 15, 2018. 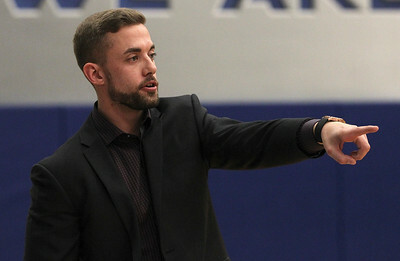 Burlington Central won, 65-40. 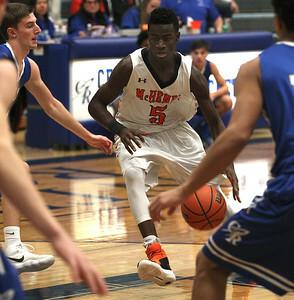 H. Rick Bamman - hbamman@shawmedia.com McHenry's Maki Mohr drives the lane in the first half in the championship game of the Burlington Central Martin Luther King Basketball Classic Monday, Jan. 15, 2018. Burlington Central won, 65-40. 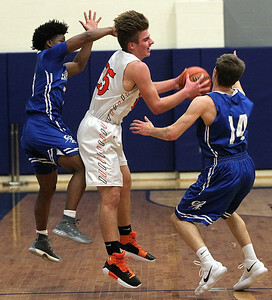 H. Rick Bamman - hbamman@shawmedia.com Burlington Central's Jake Lenschow (left) and Michael Kalusa block out McHenry's Brian March under the basket in the first half of the championship game in the Burlington Central Martin Luther King Basketball Classic Monday, Jan. 15, 2018. 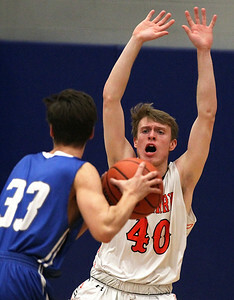 Burlington Central won, 65-40. 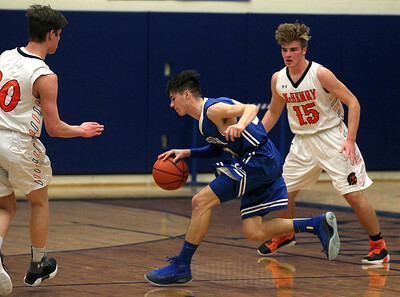 H. Rick Bamman - hbamman@shawmedia.com Burlington Central's Michael Kalusa splits McHenry defenders Brian March (left) and Patrick Diedrich i the first half during the Burlington Central Martin Luther King Basketball Classic Monday, Jan. 15, 2018. Burlington Central won 65-40. 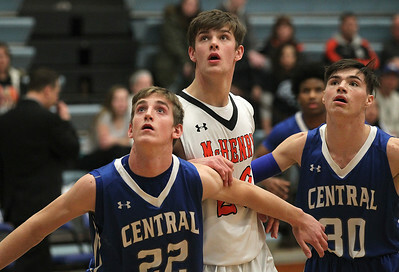 H. Rick Bamman - hbamman@shawmedia.com McHenry's Patrick Breisch (center) is double teamed by Burlington Central's Dejsani Beamon (left) and Zach Schutta in the first half during the Burlington Central Martin Luther King Basketball Classic Monday, Jan. 15, 2018. Burlington Central won, 65-40. H. Rick Bamman - hbamman@shawmedia.com McHenry head coach Chris Madson. H. Rick Bamman - hbamman@shawmedia.com McHenry's Brian March shoots past Burlington Central's Dejsani Beamon in the first half during the Burlington Central Martin Luther King Basketball Classic championship game Monday, Jan. 15, 2018. The Rockets won 65-40 to win their own tournament for the third straight year.